Home of the most professional Male Brazilian Waxing services in the city. 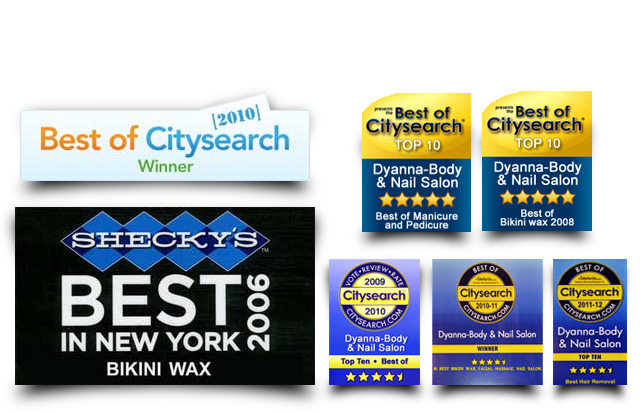 We are also one of the first professional waxing salons in the New York City, honing our trade since 1983. It’s time to throw away your antiquated shaving paraphernalia and get with the times. If you’re hesitant, let our staff of professional estheticians show you how easy and fast hair removal can be. Now, more than ever, men are turning to waxing for hair removal instead of shaving. All of you know the cuts, nicks, stubble, bumps and irritation using a razor can cause. Waxing is an awesome and affordable alternative. With this change in grooming choices, Dyanna Spa offers a number of male waxing treatments for the face and body. Facial waxing services include eyebrows, nose, upper lip, cheeks, chin, ears and neck. Body waxing services include hair removal from legs, feet, toes, legs, buttocks, chest, stomach, back, shoulders, arms, underarms, and hands. The Brazilian Bikini Waxing for men is one of our most popular services. Once only requested by members of the gay community, it is now an acceptable waxing treatment for straight men. and for most parts of the body. We use two different types of wax, depending upon the sensitivity of your skin. Both are top of the line products that have been tested and used efficiently over time. We can offer a free patch test to determine the sensitivity of your skin, which will dictate which wax we will use: Azulene wax, good for all skin types; or Cirepil Blue hard wax, for sensitive skin. Our estheticians adhere to a strict no-double-dipping policy and always wear gloves to ensure a hygienic environment for our clients. For those of you who are new to the idea, let’s take a minute to explain exactly what Male Brazilian Waxing is. It’s the removal of all or some of the hair in the genital area. How much or how little hair you want removed is completely up to you. We use two different types of wax, depending upon the sensitivity of your skin. Both are top of the line products that have been tested and used efficiently over time. Why would anyone want to submit to something as intimate and somewhat uncomfortable as a Male Brazilian Waxing treatment? There are several very good reasons why waxing the genital area for hair removal is beneficial. There are some precautions you want to take before and after you receive your Male Brazilian Waxing treatment. These practical skincare tips will help ensure that you have a positive experience. Seeing is believing! We don’t believe anyone should be denied our services by charging out-of-sight prices. Click on the circle to check out all of our affordable male waxing prices. You’ll be pleasantly surprised. Ladies, we would never leave you out! We offer our fabulous Brazilian waxing services to you too. Never hazard a cut, scratch, infection, or irritation from a razor again in your most delicate and private area. Looking for a great gift for a family member, friend, significant other, or co-worker? A spa gift certificate from Dyanna Spa is the perfect solution. Who wouldn’t want a facial, or a massage, or a pedicure for a gift, or…? There are so many spa services to choose from, you can’t go wrong.